You may remember that we recently counted down ten of science fiction's most undignified demises. One of the most ignominious deaths was the passing of Donald Gennaro, the lawyer who is consumed whilst sitting on the toilet by a hungry Tyrannosaurus Rex. Still, Gennaro's fate only scratches the surface of mortal moments to occur in the pondering room. Cinema is ripe with examples of unlucky extras consigned to a scatological send-off. Here are ten celluloid works that require a unique acknowledgment from the Library of Congress. Perhaps the most iconic of the commode monsters, thanks in no small part to a lavatory-centric advertising campaign. 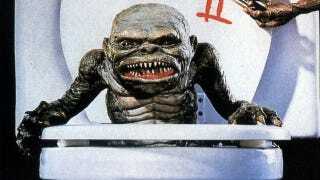 For children of the 1980s, the Ghoulies were the most unpleasantly tangible monsters in Hollywood. When I was a kid, my parents signed me up for Kindermusik classes at a local elementary school, where some sadistic teacher had hung up a Ghoulies II poster for Halloween. That poster haunts me to this day. I wouldn't experience such irresponsible pedagogy until high school, where one of the English teachers had a meltdown and screened Wesley Snipes' Blade for an entire week. Also, did you know the Ghoulies hold college degrees? This cult horror flick may have been more in the thriller vein, but we must tip our hat to film that harnesses the deadly power of the beehive grenade. This is like Psycho, but with bees. The filmmakers really should've run with that branding. In this malodorous creature feature, a nice young lady meets her demise in an outhouse. Let it be said that outdoor bathrooms can be an equally horrific destination in nonfiction as well. This 1987 horror comedy highlighted the destructive powers of body-melting fortified wine, leading one lucky fellow to become flushed. I'm surprised neither Thunderbird nor Night Train jockeyed for some serious product placement here. Any attention is good attention for such libations. Fact: Deep Rising is the best 1998 maritime science fiction horror movie starring Treat Williams ever. Always a film to go for the highbrow gag, this sequence is a metaphor for Icarus' flight toward the sun. Much as the character of Greek myth lost his wings as he approached the sun, the modern airline passenger has lost his right to fly free of herpetological junk shots. Snakes on a Plane was rich with symbolism, so I may be interpreting this incorrectly. Further annotations in the comments are appreciated. This harrowing scene appeared as one of Mark Zuckerberg's core rules for surviving an internet start-up. In reality, Zuckerberg has transcended the urge to ever the use the bathroom. He's like a human furnace. Tom from Myspace never adopted such an unflinchingly stern code, and look what happened to him. In this sequence from the famed "cosmic forces hate annoying teenagers" series, an adolescent who has evaded death finds himself trapped in a slippery bathroom. Hey, it was either this or Shannon Elizabeth in Jack Frost. Of course, if this was Final Destination XVI: The Final Destination Takes Manhattan (or whatever they're up to), this sequence would involved fireworks, a ticker-tape parade, and a special guest appearance by Ed Koch and the Knicks City Dancers. I wish I could find the exact scene from this fantastically unwatchable "guy poops out an alien" Stephen King adaptation, which is incidentally the best part of the film. When your movie peaks with some guy excreting an extraterrestrial, that's magic you can't even bottle. Oh hell, I was going to put Dreamcatcher at top honors, but everybody loves this scene. Except my lawyer mother. No seriously, she thinks Jurassic Park served up a cliched and nasty depiction of attorneys. As a child, I had to live with the knowledge that one of my parents hated Tyrannosauruses. That's a burden you carry around for the rest of your life.